Frank Tjepkema’s presentation started quite strangely. He showed us images of Holland as it might be in the future – a model of a sustainable city farm, its lack of warmth possibly caused by the inhumanely smooth computer generated graphics. 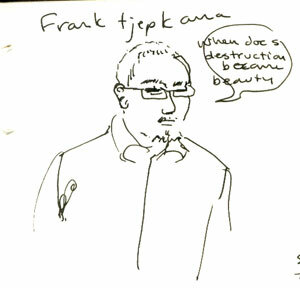 Frank Tjepkama then moved away from this slightly worrying vision of the future, and continued a theme that was apparent in many of the previous speakers – that of design that is concerned with the personal and the warmly human. Tjepkama showed footage of vases getting their unique broken pattern by being thrown and shot at. I’m sure Marcell Wanders also showed us some similar work with the destruction of objects, but cannot track down any examples.